"For me," Marcus said, "the GL-1 has completely changed the way I work. With all its features and capabilities, I don't worry about the equipment and focus on creating beautiful images for my customers." The GL-1 battery is a 24-volt, 2500 mAh NiMH pack that sells for $139.95. 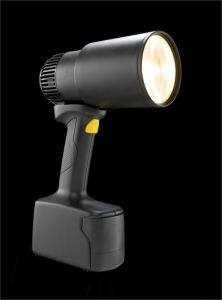 HAUPPAUGE, N.Y. -- The Tiffen Company , a leading manufacturer of award-winning accessories for the still imaging, video, motion picture and broadcast markets, has begun shipping the new compact, battery-powered Lowel GL-1 Power LED Light through the Lowel Domestic and International Dealer Network. "The Lowel GL-1 Power LED represents a new level of quality and control that can be achieved with lighting. The portable form factor keeps much better pace with any on-location shoot while the purpose-built options lets you create an atmosphere in a matter of moments with exact precision. And because the light is a what you see is what you get, "the results are always outstanding," comments Steve Tiffen, President and CEO, The Tiffen Co. "No other light delivers this type of power, flexibility and speed. We expect the Lowel GL-1 Power LED Light to become the go-to lighting for image-makers everywhere." Commenting on the Lowel GL-1 Power LED Light's impressive capabilities is one of the first GL-1 power users, Frank Salas of Frank Salas Photography Winner of the PPA and 2012 winner of the ABC-OC Trendsetter Award, "What sets the new Lowel GL-1 Power LED Light apart from the competition is its versatility. GL-1 gives me the ability to see and direct light with ease no setting up strobes and modifiers. I can quickly create unique looks and add amazing light in dark areas. Without Lowel GL-1, I would need several hours to prepare, setting up multiple flashes to achieve the same result." Salas continues, "Being able to see and control the size of the light source quickly is a game changer! With Lowel GL-1 Power LED I now can be more creative by seeing the light and shadows literally as they fall on my subjects and backgrounds. The ability to create these dynamic effects and illuminate subjects even more creatively really brings images to life." Designed in conjunction with world-renowned wedding and event photographers Brian Marcus and John Solano, the Lowel GL-1 is the perfect complement to today's dSLR cameras. It lets shooters harness the creative potential of high ISO shoots. "A revolution in portable lighting, the GL-1 Power LED is guaranteed to improve the quality of your work," comments Marcus. "For me, the GL-1 has completely changed the way I work. With all its features and capabilities, I don't worry about the equipment and focus on creating beautiful images for my customers." The Lowel GL-1 Power LED is a battery-powered, focusable and dimmable, photo-quality tungsten color LED light. This means users can control the diameter of the light beam, focusing from a tight spot to a wide flood. The beam is very even, from edge to edge, with no hot spots. GL-1's dimming ability lets users vary the amount of light output from 5-100 percent, without any shift in color temperature, to perfectly match the atmosphere of the location. With the integrity of the atmosphere maintained, photographers and videographers can see the exact effect the light has on their shot. Two Ways of Dimming: 1) Use the adjustable Dimming Trigger to quickly achieve the perfect light level for short-term handheld use; 2) Lock the light ON and dial in intensity for longer-term constant output at any level, perfect for mounted use or time lapse "Light Painting"
The Lowel GL-1 Power LED Light is available today through the Lowel Domestic and International Dealer Network at an MSRP of $699.95. For more information, visit http://www.lowelgl.com/lowel-gl-1.html.